For a small island Mykonos has an incredible selection of gorgeous beaches to choose from. The beaches on the south of the island have some of the best views and are generally the most protected from the wind. There are many famous party beaches to choose from. The most famous are probably Paradise Beach and Super Paradise. But if you prefer a quieter beach, then Platis Gialos and Ornos are great options and popular with families too. The beach located at Agios Loannis on the other hand is spectacular and dramatic and originally became famous having been featured in the movie Shirley Valentine. We have divided the beaches into two categories; Family Friendly and Vibrant party! Super Paradise Beach is one of the most famous beaches on the island of Mykonos. Located on the south coast of the island, it is the meeting point for party goers on the island. It is located right next to Paradise Beach and is reachable by car, taxi boat or bus. It was one of the first beaches to be developed on Mykonos and is also one of the most naturally beautiful beaches in Greece. The waters are crystal clear and the sand is soft and golden. Every year celebrity DJ’s come to play at Super Paradise. The beach itself opens daily at 10am and the dancing and party start each day at 4.30 p.m.
Super Paradise Beach is LGBT friendly. It is only open in the summer months and has plenty of entertainment in the form of dancers and live entertainment. It is also a great people watching spot. Paradise beach is another one of Mykonos iconic beaches. It is located 6 kilometres south of the capital Chora and close to Super Paradise and Paranga Beach on the south coast. Both are reachable by footpath from Platis Yialos. Paradise is extremely vibrant and famous for its party scene at the Tropicana Beach Bar and Restaurant. The club comes to life each day at 4pm with music and dancing that is off the charts. The Tropicana Beach Club is one of the most famous in Mykonos. The beach is well organised with beach umbrellas and loungers which you can rent for the day. In addition there are shower facilities and locker rooms. There is also an excellent diving and water sports facility on Paradise Beach. 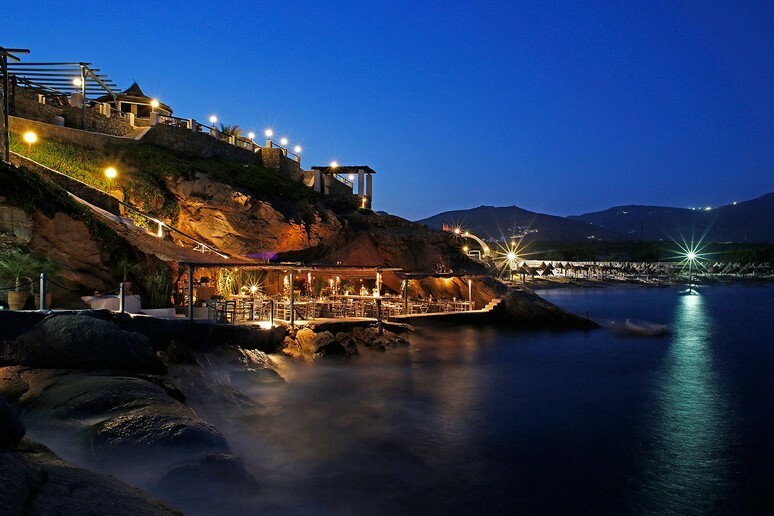 Cavo Paradiso is another very popular party club that is walking distance from Paradise Beach. It is on the cliff top above the beach. It is one of the longest established clubs on the island and opens each night at 11.30pm and keeps going until 7.00am. Every year the club has a really impressive line up of visiting international and well known DJ's and artists. It is one of the most impressive music venues on the island and has several stages which totally respect the natural surroundings. This is where you can dance the night away whilst appreciating the wild beauty of Mykonos. Paraga Beach is also worth mentioning. It is located to the west of Paradise beach on the south coast of the island. The beach itself comprises of a combination of two sandy beaches which are separated with a rock in the middle. It is roughly a 10 minute drive from Chora and is characterised by the amazing views of Paros, Naxos and ancient Delos. Paraga Beach is the beach that never sleeps and has many clubs and restaurants playing music. Amongst the vibrant options, there is also a more traditional restaurant called Tasos which is one of the best on the island and a firm favourite for anyone who likes good food. Jackie O Beach is located right next door to Super Paradise on the south coast of Mykonos. It is on a cliff top affording it fabulous views. Jackie O Beach club is a sister of the well known LGBT club in Chora. Jackie O beach club is quite unique offering fabulous music, excellent food, trendy music, unforgettable drag shows and great cocktails. The drag show starts each day at 6.00pm and offers a truly memorable experience! Psarou Beach is the most westerly located beach on the south coast of Mykonos just 5 kilometres south of the capital of Chora. It is also one of the most famous and has a reputation for attracting celebrities from all over the world. This is the spot to come and people watch. Psarou prides itself for offering extreme luxury and unparalleled beach services. The beach is extremely beautiful with golden sands and crystal clear waters. It is also really well organised and there are a variety of water sports on offer such as scuba diving. A good thing to know about Psarou Beach is that even on windy days, it is perfectly safe to swim as the waters are almost always calm. There are several excellent restaurants on the beach at Psarou. The best known of these is Nammos. It is considered to be one of the world’s most elite restaurants and the food here is outstanding. Nammos also has an incredible beach bar where you can get fabulous cocktails, light bites and dance to the many famous visiting DJ’s and live music. If you love sushi, Coo Restaurant is a great spot on Psarou beach. Then if you fancy a spot of retail therapy a visit to the well known concept store called Luisa. Agari and Elia Beaches are located next door to each other and to the west of Super Paradise about 10 kilometres south of Chora. Elia is slightly more popular as it tends to be calmer. It is also busier than its neighbour. Agari does have the benefit of an excellent and well established beach bar, also called Agari. It serves excellent Mediterranean cuisine and prides itself on its organic natural produce. A good thing to know about Agari is that it is a popular nudist spot. The beach bar on Elia Beach is also excellent. It offers simple and stylish décor with great service, excellent food and an inspiring cocktail list. Solymar Beach Club is one of the most famous on Mykonos. It is a vibrant party beach and a favourite hangout for regular visitors of the island. Solymar is located at the eastern end of Paralia Beach and is one of the original and most cosmopolitan beach bars and restaurants on the island. The beach is beautiful with clear turquoise waters and golden sands. The restaurant is excellent and offers Mediterranean cuisine with an ethnic and Asian fusion touch. They are very well known for their lobster and fresh fish. The sushi at Solymar is also especially good. Solymar really comes alive by the afternoon when they regularly have well known visiting DJ’s and live music. Scorpios Beach Club is one of the newest on the island of Mykonos and it is also fast becoming one of the hip places to visit and be seen whilst you are on the island. It is located on the hillside above Paraga Beach. It has a boho chic and very artistic style to it. During the day it is family friendly and at night it becomes very vibrant. The restaurant at Scorpios is outstanding and if you are a food lover, we highly recommend you take a visit. They take food very seriously here and offer the best and freshest organically produced food possible. The menu is primarily Mediterranean cuisine with a emphasis on vegetarian and health. Eating at Scorpios is always a special event to enjoy over long leisurely lunches and dinner with friends and family. The restaurant is open daily from 1.00pm to 11.30pm. The beach club is the perfect place to retreat to if you are looking for a day of solitude. The sun beds which are super comfortable and luxurious are laid out over three levels on the cliff side. The cabanas are wooden and blend beautifully with the natural surroundings. Mykonos Lia Beach is the most easterly located beach on the South coast of Mykonos, 14 kilometres from Chora. It is one of the most beautiful beaches on the island with lovely calm waters and a golden sandy beach. Lia is one of the beaches we recommend for families and people who are looking for a quieter day. There are rocks on either side of the beach making Lia beach a great spot for both snorkelling and diving. It is a well organised beach where you can hire sun beds and loungers. There are also shower and changing facilities on the beach. Lia beach also has an excellent restaurant called Liasti where you can get some excellent locally caught sea food and Greek specialities. Kalo Livadi Beach is another of the south coast beaches and is located roughly half way between Paraga Beach and Lia Beach in the middle of the south coast of Mykonos. Kalo Livadi beach is 9 kilometres south of Chora. It is one of the longest beaches on the island and well known for its facilities and calm waters, beautiful sands and natural beauty. It is another of the islands family friendly beaches and ideal for people who wish to spend their days away from the noisy crowds and parties found on some of the other beaches. The waters at Kalo Livadi are ideal for children as they are very shallow and calm. It is also possible to hire sun loungers and umbrellas and there is a good selection of beach restaurants to choose from for lunch. Some of the best restaurants and bars include Nice N Easy, Solmar and Barbarola. Agios Stefanos Beach is one of our Exceptional Villa team's favourite family friendly and peaceful beaches. It is just 3 kilometres from Chora and one of the closest beaches to the town. It is located north of Troulos and the new port. It is a great choice of beach in the shoulder months as it is well protected from the winds. There are several restaurants and tavernas on the beach as well as a variety of water sport facilities. Agios Stefanos also offers some super comfortable sun loungers and umbrellas and changing facilities. Platis Gialos Beach is a busy and very popular beach on Mykonos. It is also the oldest fully serviced beach on the island. It is a great family friendly beach located just 4.5 kilometres from Chora on the south coast. During the season, there is a lifeguard on duty as well as a variety of water sports on offer. Physically it is a beautiful beach with calm turquoise water and golden sands. There are many hotels and restaurants lined in front of the beach but it is possible to rent sun beds and umbrellas if you are just visiting for the day. There are regular taxi boats from different parts of the island going to Platis Gialos beach as well as a local bus. Ornos Beach is the closest beach to Chora located on the south coast and just 2.5 kilometres from the capital. It is one of the best family friendly beaches on the island but because of its location can be very busy in high season. Despite its busyness, it is a stunningly beautiful beach with clear calm waters, golden sands and very little wind. The beach also has an excellent diving school as well as a school for water skiing and windsurfing. There are several hotels and restaurants overlooking the beach. Kalafatis Beach is probably the most active beach on the island of Mykonos and is the go-to place if you love water sports. Kalafatis beach is located on the south east coast and is 14 kilometres from Chora. It is windier here than most other beaches and therefore a great spot for surfers. There are also facilities for beach volley ball, scuba diving, snorkelling, jet skiiing and windsurfing. 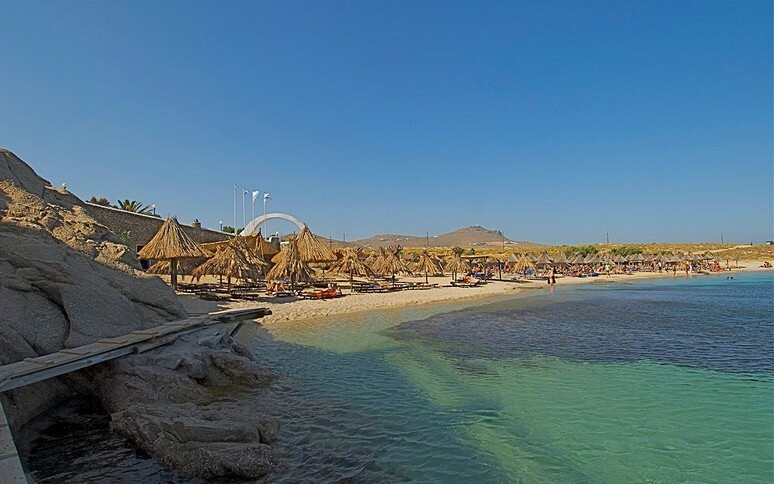 The main beach bar on Kalafatis beach is called Thalassa. There is also a hotel called the Aphrodite. You will be able to get drinks, food and cocktails in both. Agia Anna Beach is walking distance from the famous Paraga beach and is also much quieter and perfect for people looking to get away from the party scene close by. It is family friendly and one of the top choices of beaches for people looking for tranquillity. It is luxurious and simple and also naturally very beautiful. The main restaurant here is called Spillia. The restaurant is quite unique and very atmospheric as it is nestled inside a cave. The menu is primarily seafood and one of the restaurants signature dishes is the lobster pasta. The newer addition to the scene at Agia Anna Beach is the Saint Anna Beach Bar and Restaurant and is already getting some excellent reviews. Korfos Beach is one of the best beaches in Mykonos for windsurfing. The high winds that are often present provide ideal conditions and high waves. It is located 2.5 kilometres from Chora. Korfos is not the best beach for swimming but it is worth visiting the beach for lunch as there are some excellent fish tavernas on the beach. Agios Ioannis Beach is one of the most beautiful beaches on Mykonos. It is located on the south west of the island and is 4.8 kilometres from Chora. This is another of the beaches we put into the family friendly and tranquil category. There are only a limited number of beach beds for hire so if you are planning on spending the day here; it is wise to go early. Other facilities include showers and changing rooms. The sand on the beach is golden and soft and the waters are very blue and crystal clear. There is an excellent restaurant called Hippie Fish which is famous for its sea food. At night time, the atmosphere changes to an altogether more vibrant and lively one. Hippie Fish is quite famous for its night time parties. Divounia Beach is located on the south west of the island close to Lia. It is approximately 12 km from Chora and beside a lovely traditional fishing village. It is also one of the most secluded beaches in Mykonos. There are two traditional tavernas to choose from should you wish to stay for lunch. Both serve excellent fish. Fokos Beach is 11 kilometres from Chora on the north western side of the island. It is one of the furthest beaches from the more developed south coast and is therefore pretty much secluded even in high season. There are very few facilities on the beach but there is a great Greek style restaurant offering plenty of local and Mediterranean dishes. There is no public transport to Fokos. Houlakia Beach is a pebble beach located on the northern side of Mykonos just 4 kilometres north of Mykonos Town. This is not one of the best swimming spots on the island but it is one of the best places to enjoy a Mykonos Sunset. For this reason alone we highly recommend a visit. But Houlakia Beach is also stunningly beautiful. Glyfadi Beach is one of the smallest beaches on Mykonos and is located on the south western side close to Agios Ioannis and Ornos. Because the beach is partly pebbled, it tends to be much quieter than its neighbouring beach of Ornos. It is a great family spot and there are plenty of luxury Mykonos Villas in the area. It is also a good snorkelling beach. Kuzina Beach is located on Ornos Beach and boasts one of the best chefs on the island. His name is Aris Tsanalidis and he presents an Asian fusion menu which is married together with fresh local produce and Mediterranean flavours. Kuzina also offers exquisite tasting sushi. Kuzina is one of the best restaurants on the island. Kapari Beach which is located on the western side of Mykonos just a few kilometres from Chora is also one of the most spectacular beaches on the island. Despite its proximity to the main town, it is elusive and hard to find which also makes it wonderfully secluded and most often quiet. The scenery surrounding Kapari is stunning and the waters are almost always crystal clear. Kapari Beach is also seldom affected by winds. Megali Beach is one of the closest beaches to the main town. It is just 600 meters south. The beach is on the main road and tends to be frequented by teenagers. It is quite a windy beach and therefore has no umbrellas. Nikos Place is a good spot very close to the beach where you can enjoy food and a coffee.